Large Black Marlin migrate through Fiji waters and are found close in to the Great Astrolabe barrier reef . They range is size from 50 to 500kg. With 75 miles of outer barrier reef slopes, drop-offs and seamounts, Kadavu Island offers a host of deepwater jigging opportunities. 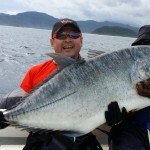 Our custom built gamefish rigged fast offshore centre console ‘Bite Me Too ‘ is available for day charters around Kadavu Island for up to 4 anglers. 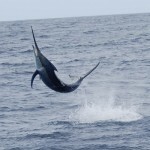 We target whatever you wish to catch from Marlin on heavy chair tackle to Ultra-lite World Record hunting. If its Marlin you want, Kadavu island sees black, blue and stripes however the predominant species caught all year round is the blue marlin. Kadavu island sees black, blue and striped marlin however the most commonly caught species and seen all year round is the Pacific blue marlin. Fish the warm tropical waters around the remote South Pacific island of Kadavu. Jungle covered volcanic hills swoop down to mangrove bays and coral lagoons. 75 miles of Great Astrolabe barrier reef with outer slopes plunging to canyons of over 12,000 feet. Blue marlin cruise within sight of the reef, yellowfin tuna smash bait balls as far as the eye can see. 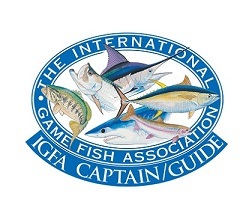 Packs of marauding wahoo cover the reef points and big Pacific Sailfish free-jump along the reef edges. Sound like an anglers paradise ? It is. Our brand new fast offshore centre console Bite Me Too is available for day charter for up to 4 anglers. 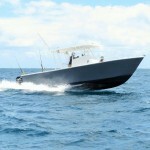 With twin Mercury 4-stroke 150HP engines she can cruise at 30kts and quickly reach any fishing destination around Kadavu Island. She is outfitted with Lowrance Chartplotter, Sounder, VHF Radio and carries life jackets for eight including all required safety equipment. She even has a Head ! Some of us never leave our homes or home towns – or never travel overseas. 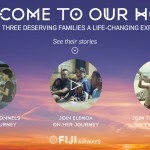 So we wanted to share how Fiji Airways recently gave three deserving families a truly extraordinary and unforgettable home away from home experience.